I am one of those makers that has storms of creativity or complete dry spells. Right now it's full on hurricane mode over here. I know I don't post much here as much as I used to a few years ago. 6 by 6 gave my creative life a new adventure. I have a deep love and appreciation for the art of kanzashi making. I was completely self taught. Learning during a time with hardly any online general craft tutorials let alone kanzashi tutorials. I dismantled a small kanzashi piece that was affixed to a doll from Japan that was given to me when I was a child. I romanticize that learning curve when I do sit down to make forever flowers. While I do make many traditional pieces for bridal or formal events, much of my work is worn on an everyday basis. I try to create examples of various ways to wear kanzashi for those who want to wear one but don't know to. The easiest way is in a brooch form, an example is pictured above. A beautiful but simple adornment adds a bit of color and something special to an everyday item. I have more examples to share and I would love to hear of any creative ways you might have worn one too. Let me know below! 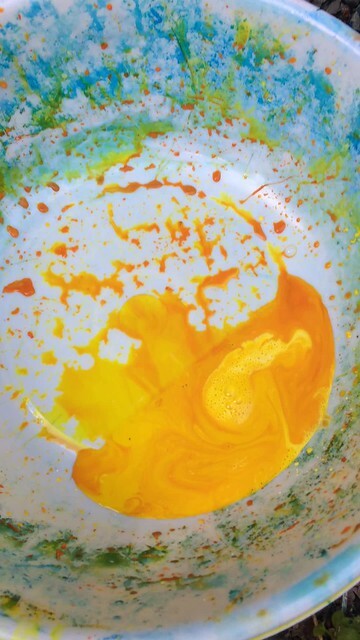 Thea Starr | Hand dyeing vintage kimono fabric linings for kanzashi. I recently shared the above photo on my Instagram account. It's just me in my backyard dressed like a regular mom on a Sunday afternoon at home, doing what I do ; hand dyeing my kimono linings. I received a few surprising comments about it. Some didn't realize that I dye some of my fabrics. Some wondered if I was doing a first time experiment with dyes. I've been doing this so long I guess I need to do refresher posts on my process every now and then to share my story with new folks that find me a long the way. While I do mix things up with my process and continuously build my craftswomen skills on my craft, my method has been consistent for the past 12-13 years. So I get comfortable and I forget to share what all I have to get to the end result of my work. Today I am sharing my dyeing process for my fabric. Technically, I should've started with the first two steps of my process; which is dismantling the vintage kimonos and then the processing of the fabrics. 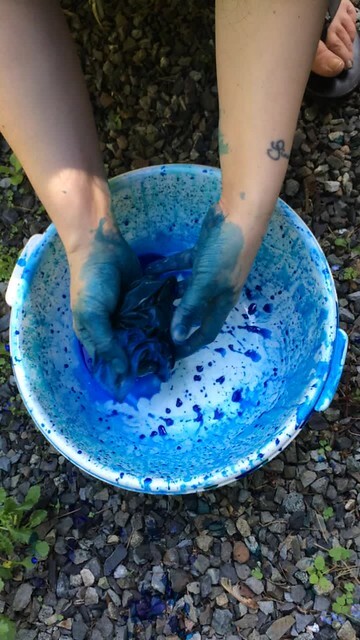 Since I happened to share some of my dye process on my Instagram, we'll just skip ahead to that. I've been exclusively using vintage kimono fabric for my kanzashi for years. Many years ago, I purchased a huge amount from Japan at a bargain and I have been pulling from that for years. During the dismantling process of the kimonos, one discovers just how much fabric it takes to make one kimono. I once pulled over 14 yards of fabric from one kimono. That included the lining. When I first started, I immediate accumulated a surplus of linings. Most of them were aged stained, torn or has insect wear. I had been an art docent for a couple of my childrens' classrooms over the years and had some left over supplies, including tie dye. I decided to see what I could do with dyeing the linings to make them usable. After experimenting with silk paints, natural plant based dyes and water based acrylic dyes, I have perfected my dye process. I owe a lot of my color mixing experience to my dad. He let me be creative with left over (very pricey) automotive paints. He let me mix them to blend paints for small projects like, a welder's cart we made. I learned a lot about ratios and how to be in control of a pneumatic paint mixer even before I was able to drive. I love bright vibrant colors. I am to create them during my dyeing process. The bolder colors also help hide blemishes in the fabrics. Each fabric takes to the dyes differently. So patience and experimentation is key to figuring what works best. You'll notice in the photos that I do not wear gloves. I use non toxic and natural dyes so I feel comfortable not wearing them. I prefer to be able to touch and work in the dyes into the fabrics with my bare hands. I try to plan to do my dyeing when I do not have to be anywhere serious for a few days. Unless I feel comfortable explaining why hands are various colors. I usually dye my fabrics outside in my backyard when I can use the garden hose to clean things up as I go. I will however, facilitate my bathtub in a pinch if the weather is bad. I do live in the Seattle area after all. Everything is hung up to dry in the sun and then I bring them in, heat set the dye by ironing them with appropriate heat temperature for the type of fabrics. Then I cut everything up on my cutting table. I'll share that process in another post. That's about it for my dyeing process. Did I miss anything? Do you have a question you'd like to ask me about my process? Are you wondering if I do yoga because of the position that I am in, in the first photo? I don't, I'm just a really flexible person and I do have the "Asian Squat" ability thanks to my mom. I know I sound like a very broken record at this point. BUT a lot of time is invested into my other company 6 by 6 Arts most of my days and wedding planning too. I have set aside time to do what I love to do, make kanzashi. Particularly wedding bouquets. While I have a few readymade on hand at The Handmade Showroom in downtown Seattle, I haven't had much available online. I remedied that a little by listing this very timeless Burgundy and Cream Bouquet. I will post more selections as they become ready. Since it is wedding season, I have pulled from my stash some kimono to deconstruct and begin the process of kanzashi making in different palettes. I am truly delighted when I find a beautiful fabric at the bottom of my storage bin and know that I can give it a new life. Vintage furisode kimono with heavy embroidery. *Full disclosure* and you already know this if you've been following me a while, I am fabric junkie. Since the day many years ago when I received a discarded kimono as a gift for quilting, I've taken a certain pride of bringing these beautiful pieces back to life. Out of all the things I do creatively, that makes me the happiest. How about you fellow crafter/makers out there? What do you create that puts a smile on your face? I'd really love to hear. With a lack of posts (most are concentrated over at 6 by 6 these days) it makes one wonder if I'm still making kanzashi. This year is a very special and full year for me this year so I am only taking a very limited number of custom orders due to time constraints. If you are interested in getting a custom order quote don't be shy and send me a message. Living on caffeine and wishing for more hours in the day. Everyone wants something. I really just want more time to do all the things that I want to do. I knew it would be a challenge starting a new business in the middle of a life change. I've done okay (aside from the lack of updates in my shops which inspired this post) considering all of that and still doing domestic mom things. Lunches for teenagers. I know, I know, crappy "granola bars" and chips. I am a firm believer of living a little. I'll likely only be participating in two local shows with my kanzashi. Urban Craft Uprising and the Homemade Harvest in Redmond, WA this holiday season. I have a few stockists in the local area and I will share a list of them in an upcoming post. I'm currently revamping the super popular Starr Flowers and will be offering more styles and sizes. So. Many. Itty bitty mini one inch kanzashi sets are in production at the moment. I hope to have fresh listings to share next week! Including the minis! Which I notoriously never post online because I rarely have them in stock. Thanks so much for your patience and keep those emails coming! Sometimes I have just the thing in stock just not posted online. I know makers love to see where other maker's make. Since I've recently reorganized my workspace I thought it would be a good time to share where I make my kanzashi. I cut and prepare all of my fabrics by hand. They are stored in piles just like this on a long table (not pictured) and await to be folded. My little corner. This is where I cut and make my smaller pieces. Larger pieces I make need a bigger "mess clean up zone." And trust me, it rarely looks this organized. Words of inspiration on the wall. (Of course made by my other company - 6 by 6 Arts). Also a small framed booklet of Orcas Island sea life. I thought the hand drawn illustrations where so sweet. It was published in Bellingham, WA and the sea life referenced in the book remind me of the same sea life that is also native to Whidbey Island. Which I am a native of. One by one. It's how I get the job done. I get a lot of amazed looks when I saw I hand fold every single petal. But after doing it this long I compare it to knitting for myself. I just get into my zone and fold, fold, fold. I want to be real with you all, my space RARELY looks like this. As most makers we are creative hurricanes with pieces and components of our work everywhere. Hence, really wanting to document this now. In general my area has a clean color palette which works for me because kimono fabric is often bright and bold, it draws my focus onto that. My work takes up many rooms and corners of my home. Stashes of fabric in the garage, my bedroom, all of my closets, dedicated work areas. It's like my birthday when I happen upon a stash that I had "forgotten" about.